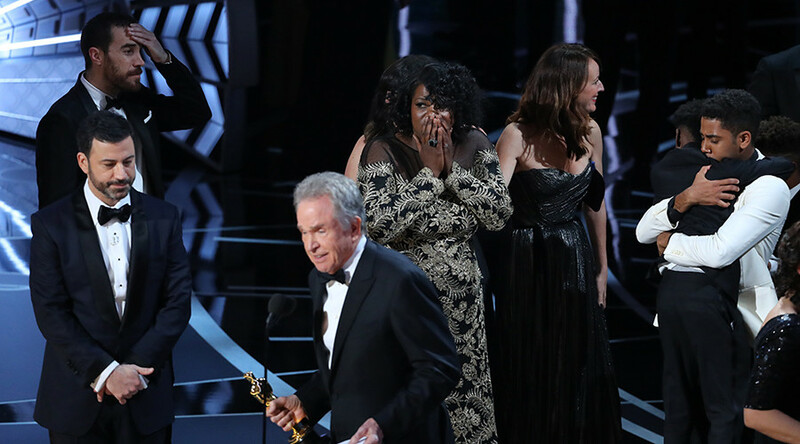 This year’s Oscars outdid themselves, with the biggest awards show on the planet managing to mismanage an envelope in an embarrassing blunder scathingly compared online with Steve Harvey’s Miss Universe gaffe and the recent US election. Others online were quick to point the finger of blame at Dunaway, who read the card despite the obvious reluctance by her co-presenter Beatty. Moments later the error was declared by a producer for ‘La La Land’, who had joined the movie’s crew on stage to accept the illustrious honor. ‘Moonlight’ was revealed as the actual winner after ‘La La Land’ had already given its acceptance speech. “This is not a joke,” ‘La La Land’ producer Fred Berger said. Beatty tried to explain the blunder to the audience. But it was too late. Social media was on fire as Twitterati pointed out embarrassing comparisons to Steve Harvey’s famous Miss Universe blunder, in which he named the runner-up as the winner. Those in attendance put on their shocked faces, in a rare moment of genuine emotion from those who usually charge millions for an expression on camera. “I really really wish this happened election night” was a sentiment echoed by Hillary Clinton supporters in their tweets, wishing the Democrats loss had been a simple envelope error. Others took to Photoshop, albeit rather crudely, to mock the moment.